We finished the house!! 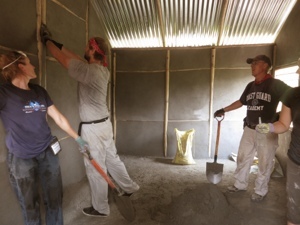 We spent the morning sifting more sand, plastering the few final walls while the technicians worked their magic and all that was left to do was to clean up. 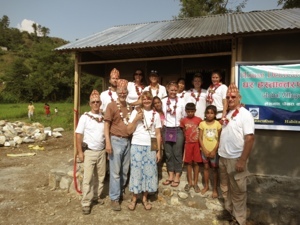 Then came our last meal together at the site and the festive house dedication. There were garlands made of flowers, tikas on our foreheads, speeches, gifts all around and the ribbon cutting. Of course, I cried, and a few others joined me. It is so very hard to say goodbye. 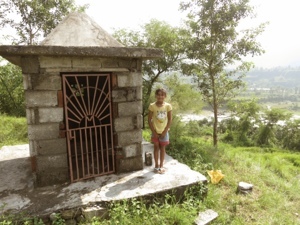 Congratulations to the HFH Nepal team and your amazing team leader on completing your project. The photos really tell a story of the impact you have had on the community there. Global Village is very fortunate to have a team leader as passionate and enthusiastic as Staci …. Never a dull moment at or away from the work site! Sign me up for her next trip! Thank you Roberto! You can be on my team – or in my boat – any time! Can’t wait to hear all about EVII!